While we love winter in Santa Fe – there’s nothing quite like the feeling of renewal during Springtime. The sun comes out and warms up the adobe and everyone wants to be outside soaking it all up. There’s no bad time to visit Santa Fe, but Springtime is probably our favorite. The weather this time of year is, we think, perfect – with temperatures hovering around 65-70º fahrenheit and sunny most days. The most you’ll need to bring is a light sweater if you’re going out for dinner! There’s no shortage of activities and events going on this time of year, so come prepared to satisfy all the senses! 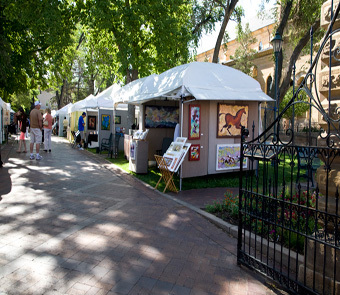 One event not to miss, and runs through the summer is the Santa Fe Artists Market opens back up on the Railyard in downtown Santa Fe on Saturdays from April -November, with juried selections from a wide variety of artists. It’s also right next to the Farmers Market, so come with your walking shoes on! The month of May is jam-packed with events every weekend for every interest. History buff? Check out the Civil War reenactment. Art Lover? Don’t miss the Eldorado Studio Tour. Love beer and/or bikes? The new Bike & Brew Festival is a great way to experience some new craft beer and enjoy the beautiful scenery Santa Fe has to offer on two wheels! No matter where your interests lie, you will find something worthy of a trip to Santa Fe – and while you’re here you don’t even have to worry about spring cleaning! Each of our properties is professionally maintained between visitors, so you know every dust bunny and cobweb will be taken care of! 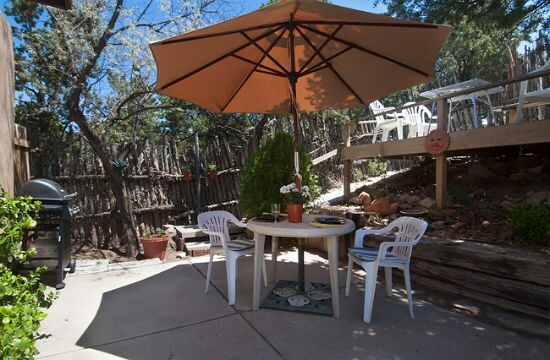 Here are some of our featured properties for springtime, that have outdoor living spaces. This entry was posted in Uncategorized and tagged artists, Farmer's Market, New Mexico, Santa Fe, spring, spring in santa fe. Bookmark the permalink.